As the Director of Biblical Studies Vicky teaches across a range of topics, including introductory to advanced study of New Testament writings, biblical hermeneutics and Greek. She is also an ordained Uniting Church Minister of the Word. 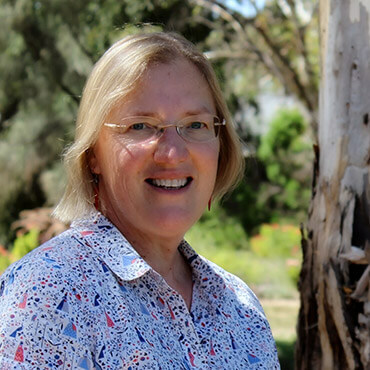 Quite a bit of Vicky’s energy is devoted to supervising students who are doing their own research for Masters and Doctoral degrees, either through Flinders University or through the ACD Masters and Doctor of Ministry programs. She enjoys doing research herself and have been done research on John’s Gospel, Colossians and ecological matters and Ignatius of Antioch. Quite a diverse range! One of the things Vicky has enjoyed in the last couple of years is teaching an intensive in Chiang Mai, Thailand, to the Masters students at McGilvary College of Divinity. She has also been a visiting scholar in the Indian Church of South India Diocese of Madras. Vicky is involved in fostering ecumenical thinking and acting, and have a commitment to helping the church to be open to receiving and using spiritual gifts. Vicky cares about the creation and living sustainably in kinship with the earth. She is married to Peter, an Anglican minister, and has two adult daughters. Growing Life-long disciples and effective missional leaders. The Uniting College for Leadership and Theology is the Uniting Church's college for discipleship and ministry training in South Australia. Uniting College is a member of the Adelaide College of Divinity. The Adelaide College of Divinity is an accredited Higher Education provider and Registered Training Organisation (RTO 4863).